How do you frame your life? Picture frames have seen some what of a revival over the past few years. Gone are the days when they were thought of as old-fashioned and something you would find on your Granny’s sideboard showcasing your worst haircut from your childhood. My Granny still has a photo of me aged two looking like Betty Boop with dark curls and a ribbon tied upon the top of my head – cringe. Nowadays picture frames aren’t just used to show off a family photo they are used to frame inspirational quotes, samples of wallpaper to match your room and to highlight your little ones latest artwork. Creating photo galleries using an array of frames is one great way of brightening up your home, showcasing some family photos whilst incorporating a family motto or maybe even postcards from your travels. 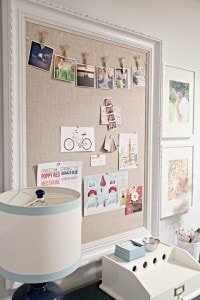 There are endless possibilities when it comes to using picture frames. I’ve been looking at ways to make use of them in an organisational way, from keeping my wrapping paper in one place, a funky memo board and a great way to keep all the children’s school flyers in one place. Follow Sarah Anguish’s board Picture frame ideas on Pinterest. Generally just the old fashioned way but always on the look out for a new interesting home idea! To frame my kids artwork in the playroom! We have lots of A3 & A2 sized posters framed! I’ve started making a picture frame collage up the stairs with lots of special photos of different milestones in my kids lives, these would add perfectly to the collection. The alcove of our fireplace is filled with a mixed array of frames. Showing off family photos, milestones, special events, and Jessicas artwork. I use big frames to make collages. I also glue a corkboard into the frame and cover it with fabric to make cool pin boards! A mixture of travel pictures I took & ones of my kids. I use them to frame family photos and memories. I’ve got photos of my parents, grandparents, pets, stepchildren and partner all in frames, but I still haven’t managed to get my degree photo or certificate framed from 7 years ago! i love the picture above, i probably would do that. To display photos or my nephews and nieces artwork. I use them for pictures of friends! put pictures of family in them. I would use for family photos. I frame my favourite photos of my children. For photos or kids artwork! To frame artwork made by the kids. To frame all of our family pics! We have photo collages but they also include reminders of fun holidays and days out with, for example, flyers for events we’ve been to, wristbands, tickets etc. my 6 year old daughter Pippa does beautiful pictures that deserve to be framed. To Frame our precious memories of time together. to frame my child’s artwork! Some of ours are on shelves and bookcases, others on walls – mostly of family photos! I have recently acquired a lot of old family photos and would love to put some of them in frames to make a display, this would fit the job perfectly. I only have a couple at the moment- mostly ‘couple’ pictures of me and Himself. But we have got HUNDREDS of pictures of the Little Chap now that I’d love to get properly printed and framed up. So then I’d have frames of family pictures everywhere 🙂 Fingers crossed! I would place pictures of our 1st child due February 2016 in these frames! My daughter will be starting playgroup soon, so I will use the frame to display her first picture she brings home. I actually don’t have any yet! We have a gallery of black and white photographs in our hallway that we want to keep adding to until the walls are full. I’d hang them in the nursery and fill them with pictures, photos and memories of all the fun times, love and adventures we all share together as a family with my little boy. I have one big wall in my living room where all my pictures are hung. I use them to frame significant photographs and need some to frame art work. To frame memories in Spain! This definitely frame our family, especially as a new addition will be joining shortly! I love to have photos scattered everywhere around our house, these would go in the newly decorated hallway! I like to put my family photos . I would like to use it as a notice board. I tend to stick to basics and just use them for photos but I wish I was more creative! currently filling them with photos of my new baby niece Ariana. To show off my friends’s amazing artwork.